So you’re looking for a knee walker. You might be surprised to know that you actually have quite a few choices, not only in brand names, but also styles and options. You may also be surprised to find out that BUYING a knee walker can cost you less in the long run than renting one. Here are a few tips when searching for your first knee walker. What Exactly is a Knee Walker? The knee walker is a fantastic alternative to the “not-so-comfortable” crutches. Anyone who has ever used crutches understands just how uncomfortable they can be. Especially if you have to use them for an extended period of time, and/or have to rely on them to traverse stairs, curbs, and other natural obstacles at long distance. 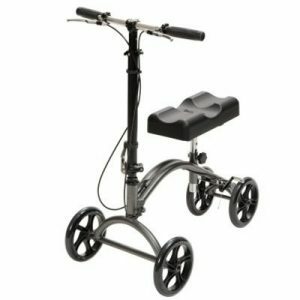 Knee walkers allow you to take weight off of your one injured leg by propping it on a comfortable, wheeled and steerable mobility device. This device will let you wheel yourself around freely without having your injured leg dangling about like you would on crutches. This helps prevent more injuries and makes moving around a whole lot easier. A good knee walker will allow you to change position height and angle to allow you to comfortably rest your leg on, no matter your height or injury diagnosis. You will also be able to change the positioning of the handlebars as well to allow you to steer the walker without having to contort your body awkwardly to be able to reach and steer the device. The majority of “good” knee walkers will allow you to make all of these comfort changes at the simple press and release of a lock and lever. If you need tools to make these changes, it’s probably not the best choice of a knee walker for you. Keep in mind that, like with any new tool or device, it will take some time to get used to. So don’t get too frustrated when first starting out. Position yourself on the walker so you have a good firm grip with your good leg and are nice and balanced so you won’t fall over. Keep your hands rested on the handle bars but don’t lean too much, and always keep a few fingers on the brakes if you start to feel like you are moving too fast. These brakes will come in handy when moving down hill. Just don’t press them too hard or too suddenly. Once you are in position, go ahead and give yourself a push, just like you would on those scooters (or skateboard) you used to use as a kid. That’s all there is to it. Get some good practice and make sure you feel comfortable enough moving on it before you venture out. As I mentioned above, there are a great variety of brands and options when it comes to selecting knee walkers. They come as cheap as $40 or as expensive as $1000 (think electric, motorized walkers). Most of the good brands, like KneeRover, will run from $149 to $349, depending on the bells and whistles you choose to have. Road wheels vs all-terrain wheels. So those are most of the options you’ll have when selecting a knee walker. In my opinion, unless you only need the walker for a week or less, it always makes more sense to buy vs rent. You’ll end up spending less in the long run, and you’ll have it available to use for yourself or loved one if you’ll ever need it in the future. I would also advise to stay away from the really cheap options. They probably won’t offer all of the same comfort options and can end up doing more harm than good. Find a well known brand, like KneeRover, decide what options you want, and pull the trigger on making that selection. You’ll be able to move around better, keep your leg better protected, and be much more comfortable moving around. Thanks for reading this article! I hope it has helped you better realize your options and what to look for when shopping for your new knee walker. Copyright text 2018 by To Rent or Buy.